Heat oven to 400°F. Bake pie crust as directed on box for One-Crust Pie, using 9-inch glass pie plate. Cool completely on cooling rack, about 15 minutes. Meanwhile, in small bowl, crush enough strawberries to make 1 cup. In 2-quart saucepan, mix sugar and cornstarch; stir in crushed strawberries and water. Cook, stirring constantly, until mixture boils and thickens. If desired, stir in red food color. Cool completely, about 30 minutes. 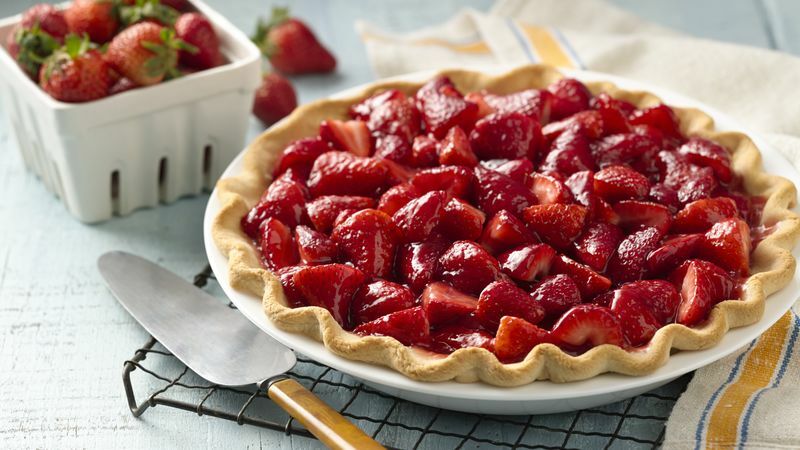 Place remaining strawberries, whole or sliced, in cooled baked shell. Pour cooked strawberry mixture evenly over berries. Refrigerate until set, about 3 hours, before serving. Cover and refrigerate any remaining pie. You can add 4 to 5 drops red food color to the strawberry cornstarch mixture if your strawberries need more color. Top with fresh whipped cream to make this even more delicious!